Koleda, O.; Broese, T.; Noetzel, J.; Roemelt, M.; Suna, E.; Francke, R. J. Org. Chem. 2017, 82, 11669–11681. 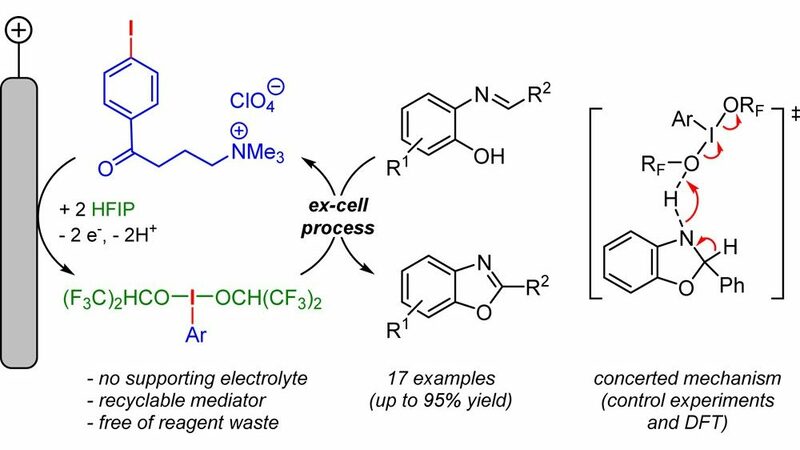 The indirect (“ex-cell”) electrochemical synthesis of benzoxazoles from imines using a redox mediator based on the iodine(I)/iodine(III) redox couple is reported. Tethering the redox-active iodophenyl subunit to a tetra-alkylammonium moiety allowed for anodic oxidation to be performed without supporting electrolyte. The mediator salt can be easily recovered and reused. Our “ex-cell” approach toward the electrosynthesis of benzoxazoles is compatible with a range of redox-sensitive functional groups. An unprecedented concerted reductive elimination mechanism for benzoxazole formation is proposed on the basis of control experiments and DFT calculations.